First you need to know what a Klein Bottle is, if you don’t. Over at Wikipedia you can learn more about what a Klein Bottle is. Once you know that you can understand the difficulties in trying to engrave one. And the bottles made by Cliff Stoll of Acme Klein Bottle makes his out of borosilicate, which is very hard and wouldn’t have liked a laser vs an engraver. 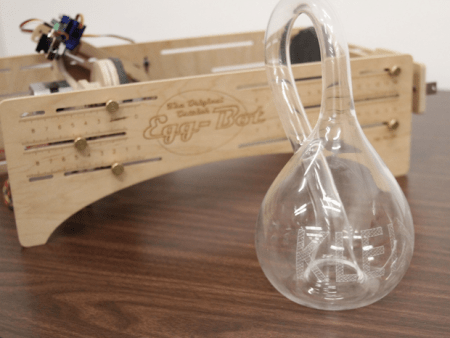 Bring in Windall Oskay and Lenore Edman of Evil Mad Scientist Laboratories, creators of the Eggbot and you have a team that figured out how to engrave on the Klein bottle…check it out over at Make, the place for gadgets and gizmos and how to make them.